A new study published Science Direct Vision Research examines what happens with our eye movements when we're drawing. The act of looking back and forth from the subject to the drawing involves the coordination of perceptual, cognitive, and muscular skills. You have to see a shape, then remember it briefly, and finally translate your understanding of it into hand movements. The main focus of this study is how the saccadic eye movements of an artist engaged in the task of drawing differ from the eye movements of a person who is free-viewing a subject without such a task in mind. 4. And they fixate longer on individual details, rather than skipping around the whole scene. No huge surprise there, I suppose, especially if you give someone a task of copying a curving line. The authors note that not many scientists have studied the specialized kind of visual perception that artists bring to the act of drawing and painting. I would be interested to see additional studies that ask subjects to solve a drawing problem that involves more comparative observation, rather than contour-following, such as accurately copying the slopes of a quadrilateral, or drawing two circles, one twice the diameter of the other. I would also be interested to see someone examine how artists use peripheral vision, squinting, blurring of the visual field, seeking alignments, and other specialized skills to shift attention from small details to the "big picture." These are skills that beginning artists take a while to master. 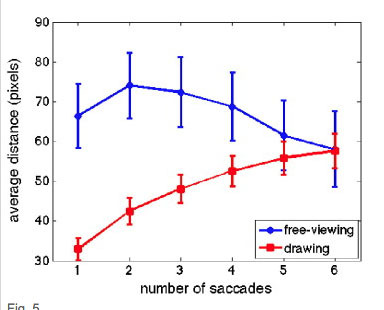 Later in the article, the authors note that there has been a lot of debate about what drives saccadic eye movements, not only in a specialized task like drawing, but in normal viewing. Are our eye movements passively driven by features in the scene, or are they actively controlled by the conscious attention? I would suspect that it's a combination of the two, and that artists in the act of drawing are much more on the "active control" end of the spectrum. 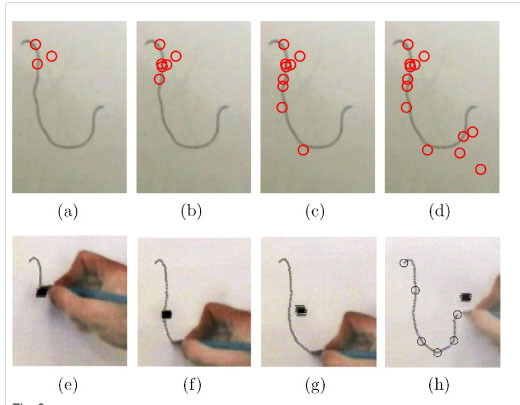 Visuomotor characterization of eye movements in a drawing task by Ruben Coen-Cagli, Paolo Coraggio, Paolo Napoletano, Odelia Schwartz, Mario Ferraro, and Giuseppe Boccignone. I'd like to thank the authors for making their study available for free, and I'd also like to thank Paul Foxton for sharing it with me. Paul Foxton, who shared this study with me, made the following observation: "What I think is interesting about this is that it may make drawing accurately more difficult, since drawing accurately is mostly about relationships, and relating the parts of a drawing to each other and to the whole. For me, it also calls calls into question the value of blind contour drawing - and contour drawing exercises in general. I've done quite a bit of blind contour drawing and enjoy. I even quite like the drawings that result, although they could never be called accurate! But, I wonder if a lot of contour drawing might wire the brain more for contour and less for a holistic view of the subject - and so make accuracy more difficult." James, I haven't been keeping up with your blog for the last few weeks and am enjoying binge reading to catch up. Itty bitty correction: "science direct" is the name of the online service that the publisher "elsevir provides" for electronic prints of its (many) journals. The article itself was published in the journal "Vision Research". P.S. I loved your last two watercolor and gauche videos!! I studied with Ted Seth Jacobs in France. He was big on eye movements, and even has a manuscript for an entire book he has written on the subject. Unfortunately it hasn't been released. I had to look up the definition of the word "saccadic" - is this a term we should already know? Even when I read the definition, I didn't really understand it. Is there a simplified explanation or analogy for what it means? Susan .....Saccadic -- I think it's a word, not to be confused with Socratic or psychotic! It describes the jumping movement that the eye makes three times per second as it scans through the scene. Each jump is called a saccade. The squinting is easiest to explain. The retina contains both rod and cone cells, the former for black/white vision and the latter for color recognition. Rods are more sensitive to light, and can therefore function better in low light environments (that's why it is harder to see colors than shapes in the dark). Squinting restricts the amount of light that reaches the retina, forcing you to use your rods predominantly and washing out color information, allowing for easier registering of value relationships. Use of peripheral vision likely works similarly as there are more rods in the periphery than cones as well. When we talk about 'bigger picture', I can talk about some interesting work in face recognition. This experiment that I remember fed pictures of a person (call him Mr A for ease) to a specialized software, alongside with pictures of others. The software was then tasked with finding what makes Mr A's face unique among other faces. The results showed certain information was more valuable in distinguishing Mr A, such as the hairline, overall shape of the face, and the shape of the brow ridge. Features ranked pretty low. In fact, I was shown a cool visual illusion at a seminar: If you take the features of Mr A, and plop them inside the face of Mr B, you recognized this composite person still as Mr B, i.e. the provider of the face shape rather than the provider of features. You will, I am sure, easily see the parallels with finding likeness in portraits. Seeking alignments is also pretty straightforward, our visual system uses a rule referred to as that of 'good continuity'. Meaning, the eye will register visual relationships that form a continuous line. This is quite strong an effect, as the continuity relationships in visual scenes are analyzed quite early in the visual cortex, superseding most other visual information. Based on this information, I may hazard a guess that artistic training essentially consists of learning pare down the information we lay on paper to the ideas that are most relevant in the brains processing of visual images. The bigger question indeed is why this is so difficult for us to do when it is what our brain does naturally in the first place ;) I think maybe it is our conscious mind, and the language of symbols that we learn to use over the years getting in the way. Long post, but I hope it sparks some thought!